Are you thinking of a particular ghost town in Montana? Yes, it was one of my old solves (like 3 years ago) at Aldridge. My blaze was the big red line going down Devils Slide, you would see this if on the Yellowstone river in Gardiner. There are areas, actually coke/tar pits near the old hospital grounds and mine cart tram ruins (heavy loads/water high). And before anyone asks, I know that the map is of Temple TX. FF probably lived on Nugent or Oakland Ave as a kid, its 1/2 mile west of the Katy RR and a block south of the cemetery where his parents are. Note: I was not BOTG here though, I was elsewhere. "+ JUMP-STARTING THE LEARNING CURVE - Page 26 - "It was easy to justify the time I spent in Spanish class looking out of the big window that was adjacent to my desk. It was on the second floor, and a beautiful old iron, slide-down fire escape was just outside that window." (window again)"
BTW, remember Lander WY? Bronze Sculpure? John Phelps? Cody WY? John's studio is named "Running Iron Studio". "I dreamed the other night that I had been reincarnated as Captain Kidd and went to Gardiner's Island looking for the treasure. It scared me so badly I was jarred awake and don't remember whether I found it or not." from the poem chapter. Well the slide is in Gardiner, in fact it was this chapter that sent me there long ago. I was not able to complete the solve, so I never went BOTG. I can't seem to insert a photo? Not sure why not? 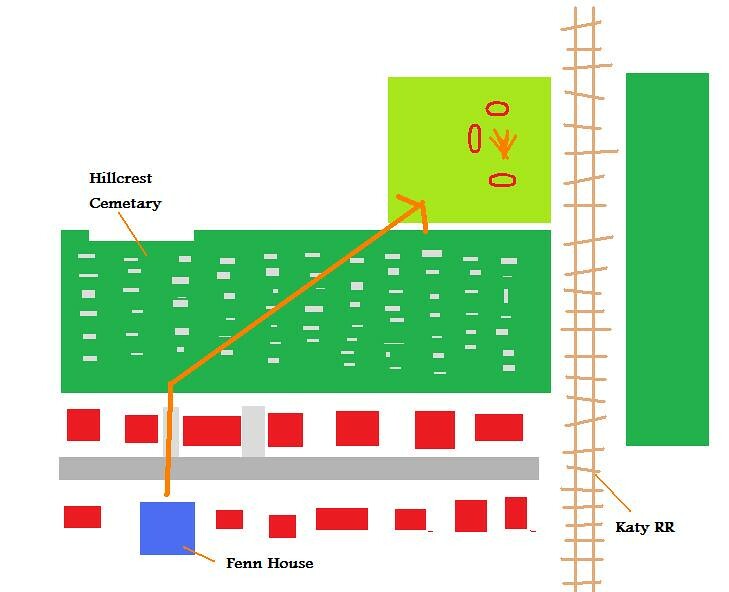 Is a map that is how the Fenn house was in relation to the Katy RR and cemetery - the cemetery was directly north, the fields (then and now) were/are to the northeast of the house (NE through Hillcrest)...their house was on North Main, if Fenn took Nugent east, it was 1/2 mile to the Katy RR tracks....by way the crow flies from his house, up to the cemetery and then NE to the fields, it was a bit more than 1/2 mile, probably closer to 3/4 mile. 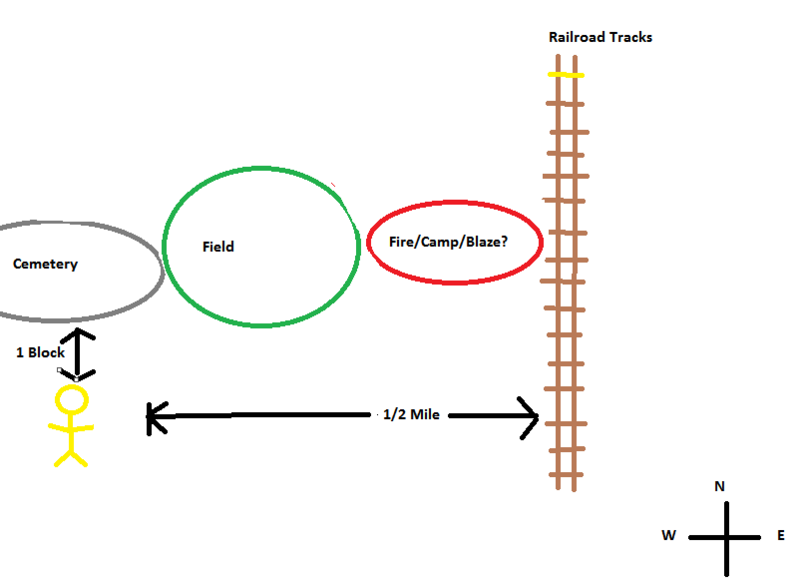 One interesting thing to note from Temple - most the Katy RR was decommissioned and converted in rails-to-trails initiatives - From Fort Worth southwest, through Temple, to Sealy, the RR remains in use though....tracks still there, trains still going. After I drew my fancy map, LOL, I went into GE to see how close I was to mapping the actual place as it is in Temple. I was surprised at how close it was doing it only from imagination (I swear, I did not cheat and use GE). I like both of your "maps." I have doodled several things as I have gone along. Mine ends up looking like I scribbled throughout my notebook. My brain is pretty messy. It's 'neat' though when patterns emerge. I have a separate notebook because I tried to keep my book nice. I wish I would've just written in the margins sometimes though. It would be nice to see my thoughts next to Forrest's. Does anyone have an explanation for this aberration in the book? On page 37, Forrest writes: "In those days the noon meal was called dinner, and we had meat only on Sunday after church. Dad usually killed a chicken and Skippy and I would pluck the feathers..." So it certainly sounds like from the context that Forrest considers chicken to be "meat". But then on the very next page, he writes: "On Saturdays I'd go out behind our house to shoot meadowlarks for supper." If a chicken is meat, why wouldn't a meadowlark also be? And yet, they only had meat on Sundays. Something's, er..., fishy.